Struggling to right itself, USA Today published 495 pages of paid advertising during the third quarter, according to Gannett's just-released quarterly financial statement. That is basically unchanged from a year ago, when the paper carried 493 pages. This is good news because it doesn't show further erosion, and bad news because it also doesn't show improvement: 495 is the second lowest number of pages in nearly three years -- evidence of USAT's financial straits. Unfortunately, we don't know what the new page count means in terms of advertising dollars. 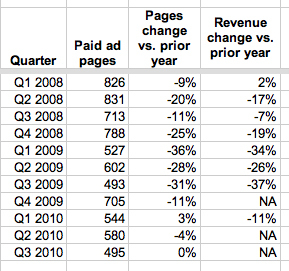 If pages are selling for less than a year ago, revenue would be lower even if the page count remains the same, or grows. That's what happened in the first quarter, when the number of pages rose 3%, but ad revenue fell 11%, according to that quarter's more detailed 10-Q report to federal regulators. In this year's third quarter, USAT's print ad revenue was down a "couple of percent;'' that's what GCI President and Chief Operating Officer Gracia Martore told stock analysts on Friday's conference call. Meanwhile, digital ad revenue soared 35.1% during the period, according to Friday's statement. But without knowing the base for print or for digital, it's impossible to know how all this adds up. What we do know is: Something happened during the spring to finally spook USAT Publisher Dave Hunke into ordering up about 130 more job cuts, and a still-evolving reorganization meant to re-emphasize a digital-first strategy. Hunke is expected to give more details on that reorg during a staff meeting set for 2 p.m. ET on Tuesday. This chart tells me everything about the ill health at USA Today. In spite of discounts and special deals the ad department is offering, ad pages are down at record lows. Something is going terribly wrong. Yes,something is terribly wrong. There's a lack of leadership at corporate. It has spread to the rest of the company. Perhaps nowhere is it more pronounced than the the flagship. The nation's newspaper needed to weather the storm in order to be competitively situated once the economy bounced back. However, USAT chiefs panicked and degraded their own product. They didn't have the stomach to accept lower profits for awhile. So they sold their soul, threw loyal and contributing employees overboard, and destroyed the reputation of a brand that took a couple decades to build. This is was greed and the need for instant gratification will do. You can come back from the recession but you can't bounce back from cutting so many corners with your own product for such an extended period of time. I'd be very surprised if USAT ever returns to the top of the mountain on any platform. By carelessly dismantling its print operation, USAT hasn't just shot itself in the foot. The growing perception of USAT in the last couple of years - among journalists, readers and advertisers - is that it isn't a serious news product. USAT, in essence, has shot itself in the head. Of course, if you don't believe that print and digital can co-exist, then I guess prematurely killing the newspaper makes sense to these empty suits. If you believe the downward trends of print have more to do with the success of the web and less to do with the economy, then why print a paper at all? Well, I would suggest that the paper is a tangible product that actually sends more people to the website. Papers will survive because millions of people prefer the format. Yes, as shocking as that might sound to some, newsprint is more conducive than a glowing screen to some consumers in certain situations. By essentially giving the finger to those readers, you're helping the competition. Abandoning a still vibrant market is just suicidal. Yeah, print is down. But radio was down for awhile too, as the trend-setters of the time laughed at the format. Heck, even TV has had slumps. Fortunately, most media companies didn't abandon TV and radio just because the numbers weren't right for a few years. But USAT and other papers don't appear to have the stomach to hang in there. As a result, when the dust clears, some papers will lose status or disappear entirely. However, the papers that maintained staffing and content will find themselves in a great position to not only rebuild readership, but to have a product that complements the web operation (or whatever new technology might come along). With the way things are going in McLean, Va., USAT won't be among that group. USAT wasn't conceived of or designed to be managed or populated by wimps. It was audacious from the get-go & everything worked on a hurry-up offense that refused to take prisoners. Somewhere along the line, that attitude was forsaken. It became genteel. And it lost the fire. And it got a soft underbelly. Oh, it's salvageable - but only with....ah, never mind. All of Gannett seems to be run by wimps nowadays & they'll never, ever get it. Note to management: You don't win anything by running scared. 10:07: USAT's not running scared; it wants to please the Tea Party crowd and Liberal crowd's AD DOLLAR simultaneously. Editorial and stories have to remain grey and bland to do that. Agree with you brother. Go hard or go home, right? The good old days are soooo long gone. 12:26 - Yep - Go hard or go home. No doubt. Sounds like a culture around there now wherein failure is an option. Only one way out of it - sell your friggin' way out of it - no matter what it takes. Sell newspapers - figure it out! Sell advertising - figure it out! Get some hunter/killers in there that know how to do that. Make the newspaper MEAN something to somebody. Anybody. Then, cry havoc & loose the dogs of war. And don't let 'em come home 'til their coffers are full of sales. Jim Gath! I remember the man well. Big office, round table, TV on but always on mute, snoop dog videos playing, new ideas flowing everyday, tons of money being generated for print.....thems were the days!